The film Farinelli, amongst its many other faults, had the major flaw that it completely ignored the most unusual and intriguing event in the singer Farinelli's life. At the age of 32 he turned his back on existing commitments and a dazzling career on the operatic stage, and he went to Spain where, the story goes, he cured King Felipe of madness by singing him the same group of arias every night. Whilst the reality was a little more nuanced than this story, the essentials are there. 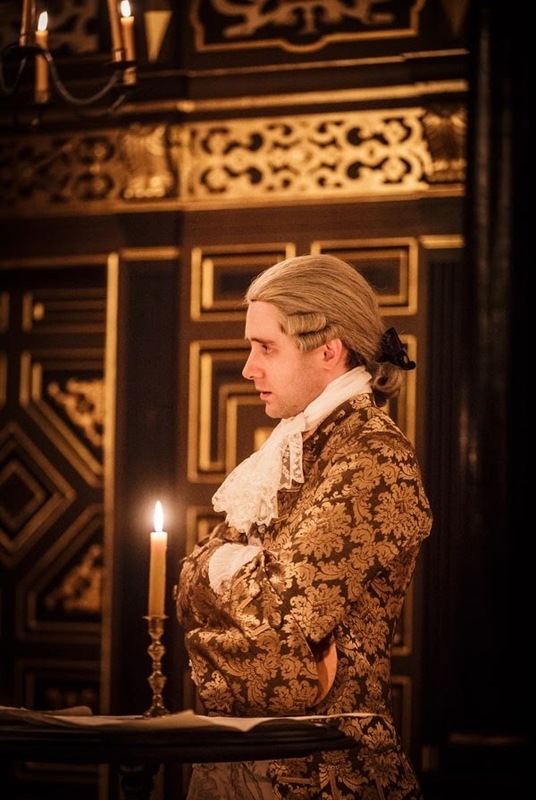 Claire van Kampen's new play Farinelli and the King, which we saw last night (24 February 2015) at the Sam Wanamaker Playhouse at the Globe Theatre explores the mystery by looking in detail at the relationship between the castrato Farinelli, Philippe (King Felipe) and his wife Isabella. Van Kampen's husband, Mark Rylance (former artistic director of the Globe Theatre) played Philippe, with Melody Grove as Isabella and Sam Crane as Farinelli, plus Huss Garbiya as Doctor Jose Cervi, Colin Hurley as Metastasio, Edward Peel as De La Cuadra. A feature of the play is the seriousness with which it treats the music (Van Kampen is also a composer) and the role of Farinelli was sung by the counter-tenor Iestyn Davies (it will be William Purefoy at some performances), with accompaniment from John Crockett (violin), Arngeir Hauksson (lute/recorder) and Jonathan Byers (cello), directed from the harpsichord by Robert Howarth. The production was directed by John Dove, designed by Jonathan Fensom. The play opened with Philippe (Rylance) on his daybed trying to catch his goldfish with a fishing rod. A threat by the King's chief minister to have the monarch declared mad and removed from the throne forced Isabella (Grove) to follow the advice of the Muslim trained Doctor Cervi (Garbiyas) and go and fetch the castrato Farinelli (Crane). Farinelli's singing improves the King and he starts to function again, but there are still oddnesses and for the second act he has taken himself, Isabella and Farinelli to live in wood so that they can 'hear the stars'. Van Kampen did bring in the historical realities, Philippe (the grandson of King Louis XIV and on the throne because of the War of the Spanish Succession) was deeply unhappy at the very formal and very dark Spanish court. His second wife, Isabella Farnese was unpopular. Farinelli sang to the King during the night, but not just the same nine arias, he sang from an enormous repertoire and Farinelli was given many other responsibilities including introducing Italian opera into Spain for the first time. 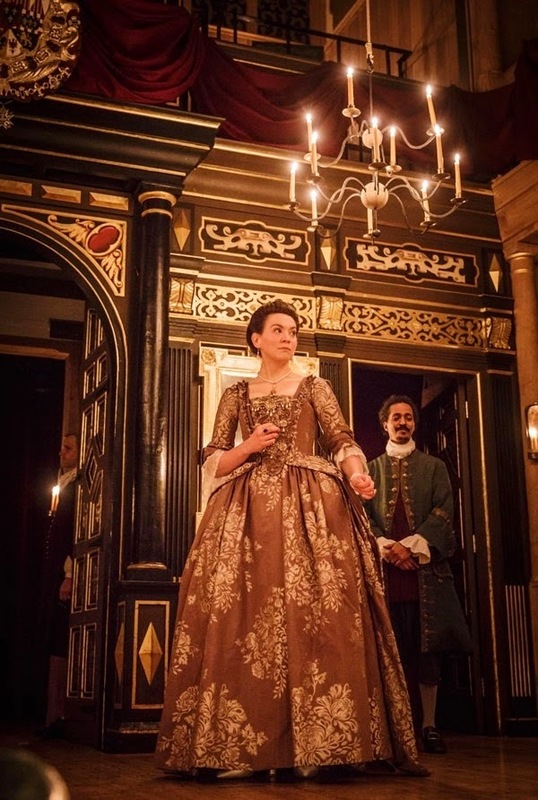 But within these confines she has crafted a fascinating play which examines why the two men seemed to get on together, why their relationship lasted such a long time and why Farinelli turned his back on his career at the height of his fame. Central to the play was the device of having Farinelli played by two people, the actor Sam Crane and the singer Iestyn Davies. Crane played the man, Carlo Broschi, who was modest and shy of demeanour, and not terribly good with words. He made a clear distinction with the singer Farinelli and it was this divide which was articulated by having the singer Farinelli played by a different person. This worked as a theatrical device because essentially the play was not naturalistic. Van Kampen's dialogue was very much in the modern idiom and though the characters were dressed in period costume, the way they spoke was very modern and very funny. That was the biggest surprise about the play, that Van Kampen treated a serious subject with so much humour, and made it work. Mark Rylance gave a tour-de-force performance as Philippe, living half in dreams and never certain whether this is dream or reality. Playing mad on stage and holding our sympathy is tricky, but Rylance did it. The humour helped, but his very direct, very personal performance made a big difference, and the Sam Wanamaker Playhouse is quite an intimate space so the performers are close to the audience. He delivered Philippe's lines in a rather stylised way, with very clipped diction which was clearly intended to convey Philippe's state of mine but which veered from the mesmerising to the mannered. But this wasn't a solo show and Grove made a delightful Isabella, bringing out her charm and her strength of personality. She and Rylance had a lively and highly believable relationship. Crane was quiet and unassuming as Farinelli the man, the sort of personality on whom people could project their own concepts. He very much conveyed the way Farinelli, setting aside the singer incarnation, might have been able to speak very directly to Philippe the man. It was a mistake, I think, to introduce the (non-historical) element of romance between Farinelli and Isabella. Certainly the historical Farinelli did fall in love with women, and Queen Isabella was regarded as very charming, but it did feel more as if Van Kampen needed something to enliven the pastoral episode. 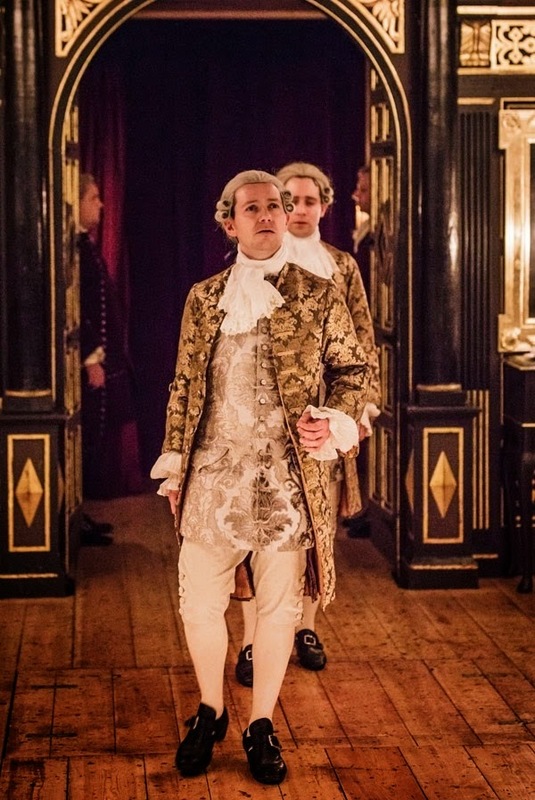 Iestyn Davies was superb as Farinelli the singer, gliding onto the stage when music was required. Dressed identically to Sam Crane, the two were sometimes on stage together and sometimes not. The convention worked as interesting theatrical device, but I still wondered what might have happened if Van Kampen had worked with a young counter-tenor prepared to put in the work to develop the spoken role as well. Davies first notes were sung off stage, as Farinelli magically tempted Philippe. Many of the arias were by Handel including Venti turbini and Cara Sposa (familiar from Davies' performances in Rinaldo at Glyndebourne) though rather frustratingly the programme did not tell you exactly what Davies was singing. In fact Handel did not feature highly in Farinelli's repertoire, and when he sang in a Handel opera in London, he brought his own arias. Quite rightly, Davies performances were very ornamented and elaborate, Farinelli's repertoire included a number of showy arias written by his brother to show off his voice. The performances were superb, with Davies being completely mesmerising with his voice filling the theatre wonderfully. It was unusual to hear music treated so seriously in a play. This was less a music-theatre piece than a play with arias and in other hands you could imagine the music taking second place to the human element. By having Davies counter-tenor accompanied by the musicians in the gallery, the music was given real presence and, unlike in an opera house, Davies could come to the very front of the stage and have a very direct relationship with the audience as on the thrust stages of the 18th century opera houses. Edward Peel gave a strong performance as the grumpy minister De la Cuadra, in a magnificent wig, struggling to run a country and prosecute war, with a skittish King. Huss Garbiya was a quiet but strong presence as Doctor Jose Cervi. Colin Hurley as Farinelli's friend Metastasio played a sort of narrator figure who filled in narrative at the open, embodied what Farinelli had abandoned during the play and closed with a nice narrative of events leading to Philippe's death and after. The play closed with a lovely vignette of Farinelli in retirement with Rylance in a cameo as his tailor, forcing him to remember and to sing for one last time. Under Robert Howarth's capable direction from the rear balcony the musicians (sometimes in the balcony and sometimes on stage) provided fine support in the arias and gave us a violin sonata to welcome us back after the second half. 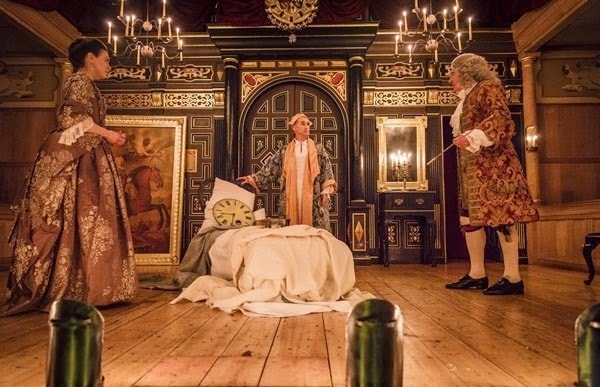 The Sam Wanamaker Playhouse, with its intimate, yet versatile, candle-lit space was ideal for the performance. Clearly the play (and maybe the production) will have a life beyond this run but it is very intimately bound to the space and the playhouse was almost another player in the drama. This was one of those pieces from which different people could take different things, but one of the strengths of the performance was way cast and performers brought all the disparate elements together to create a very real theatrical whole in which you really did suspend disbelief and come to care for the characters and their destinies.